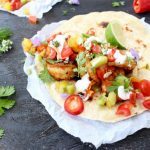 A simple street style Mexican shrimp tacos recipe loaded with the most flavorful salsa fresca and a kiss of crema! 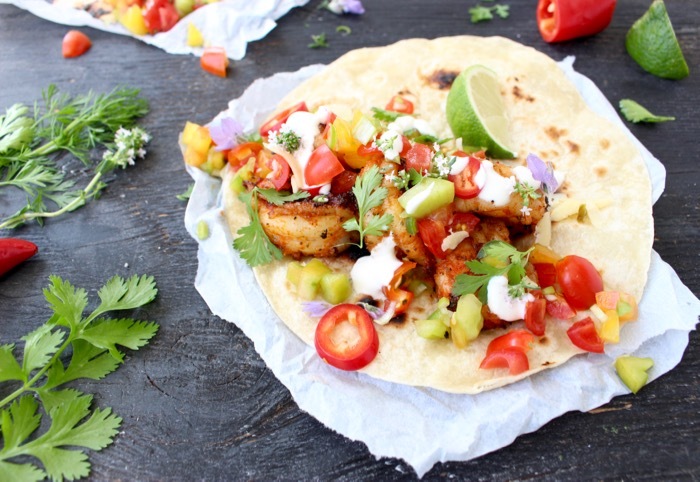 It was inevitable that I would be talking about Mexican shrimp tacos today! My brain is in vacation mode and all I want are tacos and Mojitos. Are you with me ? All year long I try to recreate at home the best shrimp tacos you can only get on the streets of Mexico. Good news is: I really think I got this down you guys! 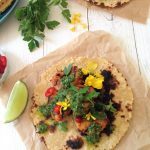 If you have some fresh wild shrimp and the right seasoning mix, tacos are some of the easiest most delicious things you can throw together on a Tuesday. If you’ve been reading the blog for some time now, you know how I feel about smoked paprika. Like the holy grail of spices, I never leave myself without at least a tin of that goodness. Hand tossed flour tortillas charred nicely on low flame on my stovetop, plus a nice scoop of heirloom fresh tomato salsa is all you need for the ultimate tacos party! Just like on the street in Mexico, I also add a little tiny drizzle of crema (sour cream) on top, and if you insist like the Batman, a little bit of shredded pepper jack cheese as well. This recipe goes to prove again that the simplest of things are the most impressive! Especially when it comes to good food. Just don’t overcook the shrimp! What I really love is that I can prep this in advance for a big Cinco de Mayo barbeque if I want. Season the shrimp and keep it in the fridge until ready to use. The day of the party I just dice up my heirloom tomato salsa or salsa Fresca, a mango salsa and buzz up some chimichurri in my beloved mini food processor, (<–amazon) just to offer variety. Now that everyone is happy, I can actually kick my feet up and sip on a mojito or two with everyone else. Make sure to dry the shrimp on paper towels very well. Transfer them to a bowl. 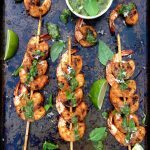 Drizzle the shrimp with a lug of olive oil and season well with the seas salt, Mexican seasonings, smoked paprika, garlic and onion powder. Use a wide spatula and Toss to coat well all over. Allow the seasoned shrimp to rest at room temperature for 15 minutes. Meanwhile work on the heirloom salsa fresca. Dice the tomatoes and toss together with the scallions, chile pepper, cilantro leaves and lime juice. Season to taste with the sea salt and set aside. Preheat a cast iron pan over medium high heat for a a few minutes. Using a pair of tongues add the shrimp to the hot skillet. Sear for about 45 seconds on each side until it curls up and is golden brown on both sides. Transfer the cooked shrimp to a plate and keep warm while charring the tortillas. Place each tortilla on a burner with low flame until nice charred marks form. About 30 seconds or so, keep a close eye on them so they don't burn. Assemble your tacos by placing the shrimp inside the charred tortillas, spoon some of the salsa Fresca on top and a light drizzle of crema or sour cream. Garnish with cilantro and the chile pepper slices to taste. 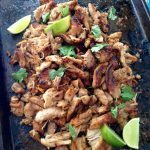 Serve with the lime wedge to squeeze on top right before the first bite ! Oh my word! These look absolutely divine. Such great flavours. This looks like some great street food that would sale out at food truck festival! I am pinning this and cooking asap!! !! 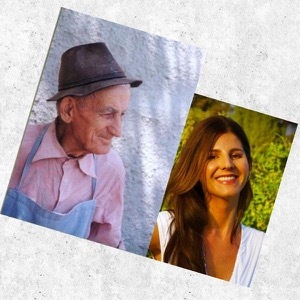 You are giving me ideas Sharee…Should there be a taco truck in my future hmmm..
Ooooh yum! Pinning this and cooking asap for our next get together with friends. Nothing better than a super impressive and delicious feast that takes almost zilcho preparation so you can sit back with that mojito haha. Totally agree about that smoked paprika too! It’ s like a secret ingredient that makes everything savoury taste so much better. Smoked Paprika is everything and a bag of chips, no kidding ! I’m super in love with it, I swear it makes these shrimp tacos. 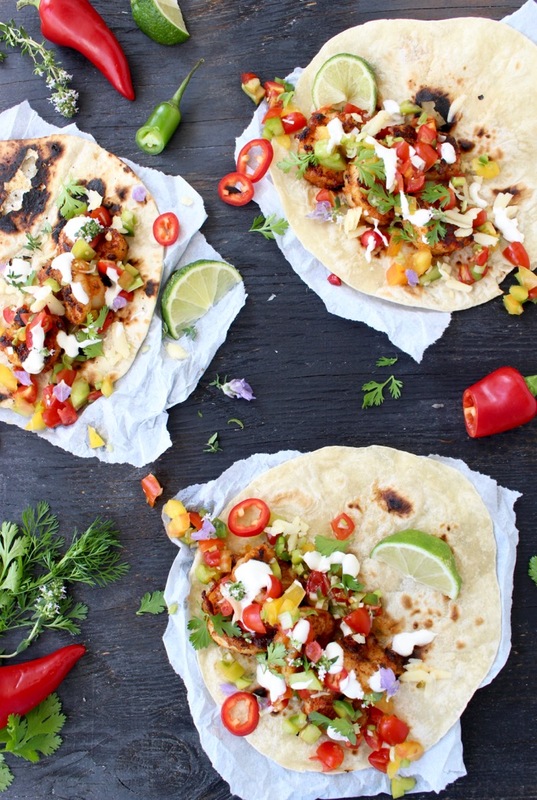 I am so excited about all the Mexican recipes around at the moment for Cinco De Mayo! 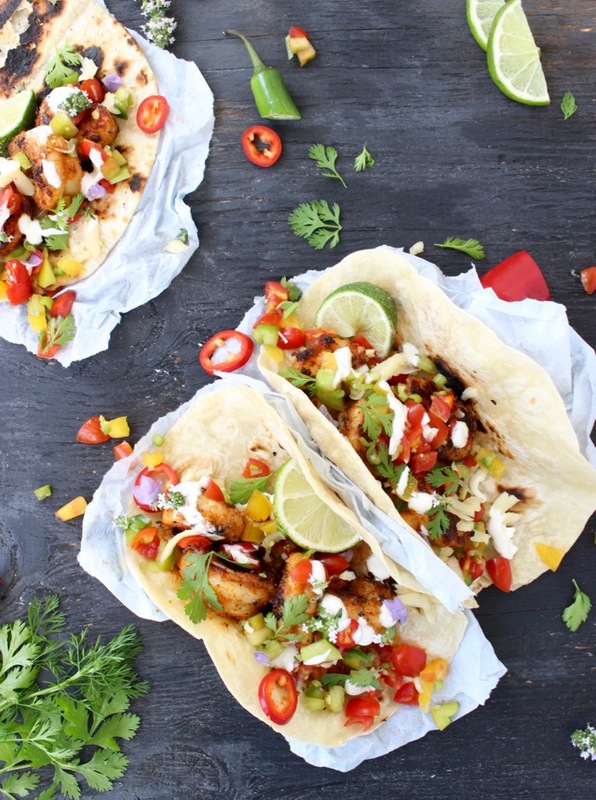 These tacos look so light and fresh. 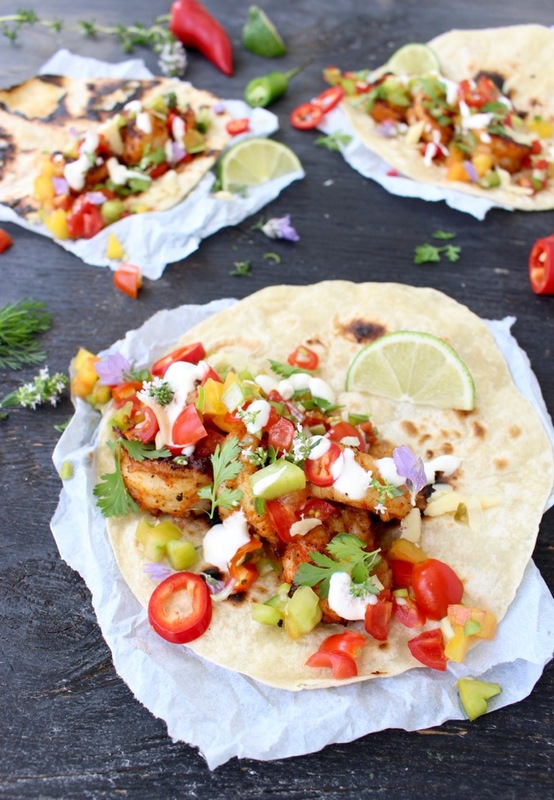 I love shrimp tacos, these sound amazing, especially with that heirloom salsa fresca on top, yum! I want these for dinner tonight! 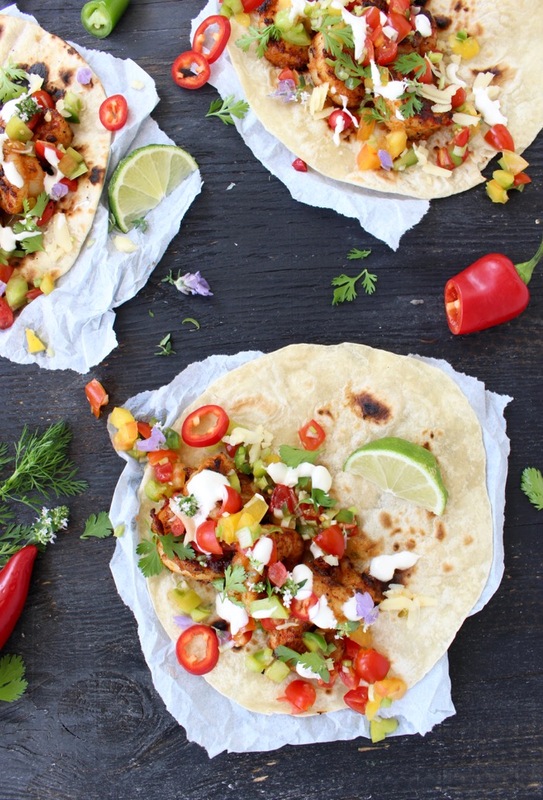 But they also would be SO perfect for Cinco de Mayo – they look so flavorful and absolutely delicious. 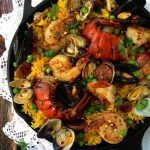 Yes on the Cinco de Mayo menu for sure ! Sounds amazing!!! What no salt Mexican spice do you use? I use the Spice Hunter organic mix. What salt free Mexican seasoning do you use? I use the salt free organ Spice Hunter. Using a pair of TONGUES?! Laughed my head off! Great recipe. May I suggest tongs for future use? Lol.